It’s easy enough to believe that drought, floods, hurricanes, and earthquakes are signs of a coming catastrophe from global warming, but these are normal variations of any climate that we — and other forms of life — have survived. Earth has undergone many serious changes in climate, from the Ice Ages to periods of heavily increased plant growth from their high levels of CO2, yet the biosphere has survived. We’re adaptable, stubborn, and persistent — and we what other life forms don’t have: we can manipulate our environment. Show me an Inuit who can survive in his habitat without warm clothing… Humans will continue to infest Earth because we’re smart. …reigning supreme, is the “zombie argument”: arguments which survive to be raised again, for eternity, no matter how many times they are shot down[http://www.newscientist.com/article/dn11462]. “Homeopathy worked for me”, and the rest. Zombie arguments survive, they get up and live again, immortal and resistant to all refutation, because they do not live or die by the normal standards of mortal arguments. There’s a huge list of them at realclimate.org, with refutations. There are huge lists[http://scienceblogs.com/illconsidered/2008/07/how_to_talk_to_a_sceptic.php] of them everywhere[http://scholarsandrogues.wordpress.com/2007/07/23/anti-global-heating-claims-a-reasonably-thorough-debunking/]. It makes no difference. 1. Climate change will be worse for the poor. Everything is worse for the poor. The issue is poverty and inequality, then, not climate. Small differences in climate that produce negative human effects do so because of a lack of wealth or otherwise a lack of civil infrastructure. The outcome of policies and international agreements to limit productive activity and development can therefore only increase inequality and decrease wealth, putting poorer people closer to their environment, for a marginal – if any – positive change in the weather. Environmentalism will be worse for the poor. 2. An organised and well-funded network of climate change deniers has distorted the public debate. The environmental message has been faithfully and sympathetically reproduced by the UK’s media. The BBC’s output is predominantly green, and its news rarely covers the climate debate critically. The few hours of programming that have been broadcast on UK television networks that have given an airing to scepticism have become the object of anger. But you can probably count the number of such programs broadcast in the last decade on one finger. Meanwhile, there are many hours of programming each week, reflecting the orthodox, consensus position, within lifestyle, current affairs, science, and ethics programming. Print media is more divided, with all papers occasionally featuring sceptical perspectives. In the case of UK newspapers, the Guardian, Independent have clearly climate-orthodox editorial agendas – climate change is anthropogenic and a looming catastrophe, and we must all reduce emissions now. The Times and Telegraph are more sceptical, but not (Christopher Booker aside) of the idea that the planet is warming and much of that is anthropogenic. The Daily Mail does take a more sceptical view of the basic science, to the fury of environmental activists. The Sun, Mirror and Express are widely assumed to push a sceptical line, but they clearly do not – see here, here, and here. The three main political parties embraced the green agenda comprehensively, each promising to take it more seriously than the last. Yet the principles these parties have taken up have not once been tested democratically. No party has dared to step out of line on the climate issue. The public debate has been entirely dominated by the orthodox position. If there has been an attempt to distort the public debate it has been entirely ineffectual. It does not get airtime. It has not bought politicians. It has failed to establish an organised, institutional response. The media is dominated by the environmental message, companies go out of their way to demonstrate their environmental ethical credentials, politicians rarely ever dare to challenge environmental issues. The image of the climate sceptic remains one who speaks for himself rather than one who speaks from within the academy, party, corporation, and against the majority of his peers. Yet the public have not been convinced. This can’t be explained as the consequence of a new trust in mavericks, and the influence of a conspiracy to distort the debate. As for the ubiquitous claim that the debate has been skewed by corporate funding – especially oil money – what tends to be forgotten are the much larger sums available to the likes of Greenpeace and WWF to push their own exaggerated alarmist line. Or in the words of Susan Watts, science editor of the BBC’s prestigious Newsnight, ‘In fact scientists calculate that Obama has four years in which to save the world.’ The argument for action to mitigate climate change has always depended on generating a sense of urgency to get itself heard above the background noise of apathy, disinterest and disengagement from contemporary politics. The comprehensive change in our political, economic, and industrial mode of existence that greens want to create will take some persuasion. Accordingly, those riding the climate change bandwagon have had to illustrate their narratives with claims about when climate change will reach its ‘tipping point’, when we can expect disaster to arrive, and at what point we will pass the deadline for creating the comprehensive legal and institutional response to climate change. As there is a perception that the public conceive of climate change as some far away distant prospect, this strategy is perhaps intended to bring the realities of climate change closer to our imaginations. Yet it depends on myth-making, and overstating the predictive abilities of climate science. The ‘scientific consensus’ that late 20th century warming can be attributed to human activity is routinely confused with the putative consequences of climate change – particularly social effects – and the political arguments for climate change mitigation. But even if there exists a consensus about the temperature record and its cause, there remains less of a consensus about what the first, second, third, and Nth-order effects of climate change will be. There is, for instance, much less agreement about how global warming will turn into sea level rise, species extinction, and human effects. The consensus on attribution cannot reasonably extend to represent an agreement about what the effects of climate change are, and what is the best policy response is. The failure to delineate the principle cause and its effects, and the effect of its effects, is a mistake that leads to the unhelpful polarisation of the climate debate, opening up proponents of climate change mitigation policies to the criticism that they have hidden prejudice and bad faith behind ‘science’. It is frequently argued by scientist activists, politicians, and campaigners that the IPCC represents thousands of the worlds top climate scientists. This is a misconception of the IPCC, of its contributors, function, purpose, and process. The IPCC does little science itself, and does not measure the opinions of the contributing authors. It is divided into three working groups, focusing respectively on the physical science basis (WGI), impacts, adaptation and vulnerability (WGII), and mitigation of climate change (WGIII), each reviewing the existing literature in their fields. Each of these working groups is further divided into chapters, and again into sections. A contributing author to chapter 3 of WGI may never enter a working relationship with a contributing author to chapter 4. They may have very little to say about each other’s work, and are not asked to agree or disagree with it. WGII and WGIII cannot be characterised as populated entirely by scientists, as the zombie argument claims. Instead, these working groups consist of social scientists, economists, and other non-climate and social-scientific disciplines. Moreover, as their task is to understand the impact of climate change on human society, we have argued that this process requires political and subjective precepts which assume a relationship between society and the climate/environment. These precepts and assumptions are not necessarily well-grounded in science, and take as their premises the conclusion to their own study: environmental determinism, and the inevitability of catastrophe. Worst still, these prejudices are the tenets of political environmentalism. That is to say that the IPCC’s work is ‘institutionally environmentalist’, and has been established to fulfill a political need: not simply to provide the political process with evidence with which to make decisions, but to give moral authority to governments embracing the same environmental agenda. The implication of the argument that ‘the science’ attributing global warming to human activity is settled is that this creates imperatives to cease such activity, and to reorganise life around the principles of environmental sustainability. Frequently, politicians making arguments for mitigation express their adherence to ‘the science’, and that ‘the science is clear’. Creeping lines on charts representing the loss of Arctic sea ice return each summer, and are held each summer to speak for themselves as ‘canaries in the coal mine’ signaling our imminent demise. But the environmental argument in fact posits a political claim prior to science. It holds that human society can only exist within unchanging environmental circumstances, and that the normal process of politics must therefore be suspended in order to balance the concentrations of gases in the atmosphere. ‘The science’ merely serves to confirm that the world is changing, rather than to substantiate the basis of environmental determinism. As we argue often here on CR, ‘the politics is prior to the science’ in the climate debate, and the emphasis both ‘sides’ in the debate place on science impedes any progress on understanding the political claims either side are making. As we also often say, in order to understand what ‘science says’, it is necessary to understand what it has been asked. As Goldacre observes, the same arguments return to the climate debate. But his perspective is too narrow, and he neglects to scan his critical eye over the substance of the claims made by the camp he seemingly attaches himself to. In the process, he has summoned up an inconvenient metaphor. Environmentalism is zombie politics. It is oblivious to human ambitions, desires and development, other than it seeks to devour them as it turns humans into copies of itself: lifeless, purposeless, walking corpses that would be better off dead. Human life is reduced to meeting necessity and politics becomes the process of managing subsistence rather than contesting ideas about possible futures. It turns humans against humanity. On the BBC’s Horizon tonight, Sir David Attenborough, patron of the Optimum Population Trust, tackles the question How Many People Can Live on Planet Earth? Except he doesn’t. He comes up with an answer alright – 15 billion if we all live like the average Indian, 2.5 billion if we all live like we do in the UK, and 1.5 billion if we all live like fat, horrible Americans. It’s all derived entirely from standard ecological footprint stuff. Malthus’s principle remains true. The productive capacity of the Earth has physical limits. And those limits will ultimately determine how many human beings it can support. But the picture may be even worse than this. These figures are based on rates of consumption that many think are already unsustainable. In Friday’s Independent, Johann Hari has achieved a quite remarkable feat. Are you prepared to take a 50-50 gamble on the habitability of the planet? In just 1400 words he manages to cram in just about every fallacy from the environmentalist’s handbook: he appeals to the dodgiest of authorities, sells politics, catastrophism and factoids as scientific truth, misrepresents his opponents’ arguments, cherrypicks data, explains human behaviour in biologically deterministic terms and politics in environmentally deterministic ones, and resorts to the green equivalent of Pascal’s wager while accusing ‘deniers’ of religious zeal. Every day, I pine for the global warming deniers to be proved right. I loved the old world – of flying to beaches wherever we want, growing to the skies, and burning whatever source of energy came our way. I hate the world to come that I’ve seen in my reporting from continent after continent – of falling Arctic ice shelves, of countries being swallowed by the sea, of vicious wars for the water and land that remains. When I read the works of global warming deniers like Nigel Lawson or Ian Plimer, I feel a sense of calm washing over me. The nightmare is gone; nothing has to change; the world can stay as it was. We should believe Hari and Brigstocke, their argument goes, because they have access to information that we do not. It’s the very stuff of dodgy dossiers. (Talking of which, Hari initially supported the invasion of Iraq, so we look forward to another article at some point where he confesses how ‘terribly wrong‘ he has been on climate change, too.) What’s more, merely witnessing melting polar ice for yourself is merely evidence that polar ice melts when it’s warming enough. There is a gaping crevasse between what Hari and Brigstocke have seen and what they think it is evidence for – which is that catastrophe beckons. Hari and Brigstocke’s personal investments in the plight of the Arctic means we should be less, not more willing to believe them. But then I go back to the facts. However much I want them to be different, they sit there, hard and immovable. Nobody disputes that greenhouse gases trap heat in the atmosphere, like a blanket holding in the Sun’s rays. Nobody disputes that we are increasing the amount of those greenhouse gases in the atmosphere. And nobody disputes that the world has become considerably hotter over the past century. (If you disagree with any of these statements, you’d fail a geography GCSE). Yet half our fellow citizens are choosing to believe the deniers who say there must be gaps between these statements big enough to fit an excuse for carrying on as we are. Shrieking at them is not going to succeed. Our first response has to be to accept that this denial is an entirely natural phenomenon. The facts of global warming are inherently weird, and they run contrary to our evolved instincts. If you burn an odourless, colourless gas in Europe, it will cause the Arctic to melt and Bangladesh to drown and the American Mid-West to dry up? By living our normal lives, doing all the things we have been brought up doing, we can make great swathes of the planet uninhabitable? If your first response is incredulity, then you’re a normal human being. Meanwhile, normal human beings are apparently impervious to the onslaught of PR from green pressure groups. As we’ve shown elsewhere, the funds available to the likes of Greenpeace and WWF are orders of magnitude greater than that spent by the ‘well-funded denial machine’. …Every single year since 1917 has been hotter than 1917. Every single year since 1956 has been hotter than 1956. Every single year since 1992 has been hotter than 1992. And on, and on. If we dramatically increase the carbon dioxide even more – as we are – we will dramatically increase the warming. Many parts of the world will dry up or flood or burn. According to the Met Office’s annual global data series 1850-1998, 1917 and 1992 were exceptionally cold years: there were only 5 years cooler than 1917 in the preceding 66 years; after 1992, the next coldest year was 1878. And we can all play Hari’s game: every year since 1998 has been cooler than 1998, for example. Moreover, all Hari has achieved here is to restate his initial uncontested premise that the world has been warming over the last century. Just saying it a bit louder this time doesn’t make it any more important or dangerous, or informative as to how to respond. Which is why he has also had to escalate the alarmism. This is such an uncomfortable claim that I too I have tried to grasp at any straw that suggests it is wrong. One of the most tempting has come in the past few weeks, when the emails of the Hadley Centre at the University of East Anglia were hacked into, and seem on an initial reading to show that a few of their scientists were misrepresenting their research to suggest the problem is slightly worse than it is. Some people have seized on it as a fatal blow – a Pentagon Papers for global warming. By now, Hari has drifted far from his reference point of the physics of the greenhouse and is bobbing around helplessly in a sea of catastrophism. The gap can be bridged only by a blatant untruth. Having started the paragraph with the statement that what followed were the true facts, he just makes it up. ‘Hundreds of thousands of scientists’? And there we were thinking that the ‘2500 scientists of the IPCC‘ claim was overstating things. All the scientists, in all the world, across all the scientific sub-disciplines, probably only amount to hundreds of thousands. And it gets worse with almost every additional word: ‘Hundreds of thousands of scientists have independently‘ reached the same conclusion? Is that even humanly possible? Does he think that each scientist has their own personal ivory tower or something? ‘Hundreds of thousands of scientists have independently reached the conclusion that it will have terrible consequences‘? …It would be very surprising if, somewhere among them, there wasn’t a charlatan or two who over-hyped their work. Such people exist in every single field of science (and they are deplorable). So let’s knock out the Hadley Centre’s evidence. Here are just a fraction of the major scientific organisations that have independently verified the evidence that man-made global warming is real, and dangerous: Nasa’s Goddard Institute for Space Studies, the US National Oceanic and Atmospheric Administration, the UN’s Intergovernmental Panel on Climate Change, L’Academie des Sciences, the Indian National Science Academy, the US National Academy of Sciences, the Deutsche Akademie der Naturforscher Leopoldina, the UK’s Royal Society, the Academia Brasileira de Ciencias, the Chinese Academy of Sciences, the Russian Academy of Sciences, the US Environmental Protection Agency… I could fill this entire article with these names. Well, at least he’s not citing citing himself this time. But he is wrong to say that these institutions have independently verified the evidence. Research bodies such as NASA and NOAA do, like Hadley, collect and analyse data, and test hypotheses, but Hari is lumping these together with scientific academies and professional bodies that represent their membership politically, which have simply issued position statements to the effect that the world has been warming, that anthropogenic greenhouse gases probably have much to with it, and that this presents problems. To ‘knock out the Hadley Centre’s evidence’ is to write off, among many other lines of research, its global surface temperature record (HADCRUT), which, along with NASA’s GISTEMP, is perhaps the most scientifically important and politically influential climate datsets in existence. A further sign of Hari’s ignorance on the matter is that it was the University of East Anglia’s Climatic Research Centre (CRU) that was hacked, not Hadley. And Hadley is part of the UK Met Office, not, as Hari says, UEA. But Hadley produces HADCRUT in conjunction with CRU, so by Hari’s reckoning Hadley and CRU should both be ‘knocked out’. Which leaves him with a single temperature record, and a bunch of position statements from organisations that exist to represent their members’ interests. Last year, we took a look at the gestation of the statement issued by one of those professional bodies – the American Geophysical Union – and argued that these statements should be seen as political attempts to put science centre-stage of climate debates rather than objective appraisals of the state of knowledge. And they haven’t only used one method to study the evidence. They’ve used satellite data, sea level measurements, borehole analysis, sea ice melt, permafrost melt, glacial melt, drought analysis, and on and on. All of this evidence from all of these scientists using all these methods has pointed in one direction. As the conservative journalist Hugo Rifkind put it, the Hadley Centre no more discredits climate science than Harold Shipman discredits GPs. Climategate may not discredit climate science, but neither does climate science uphold Hari’s apocalyptic vision. A study for the journal Science randomly sampled 928 published peer-reviewed scientific papers that used the words “climate change”. It found that 100 per cent – every single one – agreed it is being fuelled by human activity. There is no debate among climate scientists. There are a few scientists who don’t conduct research into the climate who disagree, but going to them to find out how global warming works is a bit like going to a chiropodist and asking her to look at your ears. For Hari, the fact of climate change is equivalent to the moral imperative he thinks it produces. To say that ‘climate change is real’, is to say ‘what is to be done’. As with so many other activists, there is no argument about how to interpret climate change statistics to work out a sensible response. So any degree of scepticism, or any argument about how to respond to degrees of climate change with degrees of responses naturally returns Hari to the core, binary, fact: ‘climate change is real’. Part of the confusion in the public mind seems to stem from the failure to understand that two things are happening at once. There has always been – and always will be – natural variation in the climate. The ebb from hot to cold is part of Planet Earth. But on top of that, we are adding a large human blast of warming – and it is disrupting the natural rhythm. So when, in opinion polls, people say warming is “natural”, they are right, but it’s only one part of the story. What worries Hari is that the ‘public mind’ has coped with the nuances of the debate. The idea that the extent of climate change and its effects might have been exaggerated is dangerous. Once you have grasped this, it’s easy to see through the claim that global warming stopped in 1998 and the world has been cooling ever since. In 1998, two things came together: the natural warming process of El Nino was at its peak, and our human emissions of warming gases were also rising – so we got the hottest year ever recorded. Then El Nino abated, but the carbon emissions kept up. That’s why the world has remained far warmer than before – eight of the 10 hottest years on record have happened in the past decade – without quite reaching the same peak. Again: if we carry on pumping out warming gases, we will carry on getting warmer. That’s why I won’t use the word “sceptic” to describe the people who deny the link between releasing warming gases and the planet getting warmer. I am a sceptic. I have looked at the evidence highly critically, desperate for flaws. The overwhelming majority of scientists are sceptics: the whole nature of scientific endeavour is to check and check and check again for a flaw in your theory or your evidence. Any properly sceptical analysis leads to the conclusion that man-made global warming is real. Denial is something different: it is when no evidence, no matter how overwhelming, could convince you. It is a faith-based position. We have no idea where he plucked these figures from. Hari was born in 1979, which, as luck would have it, is when the US National Snow and Ice Data Center (NSIDC) satellite records begin. 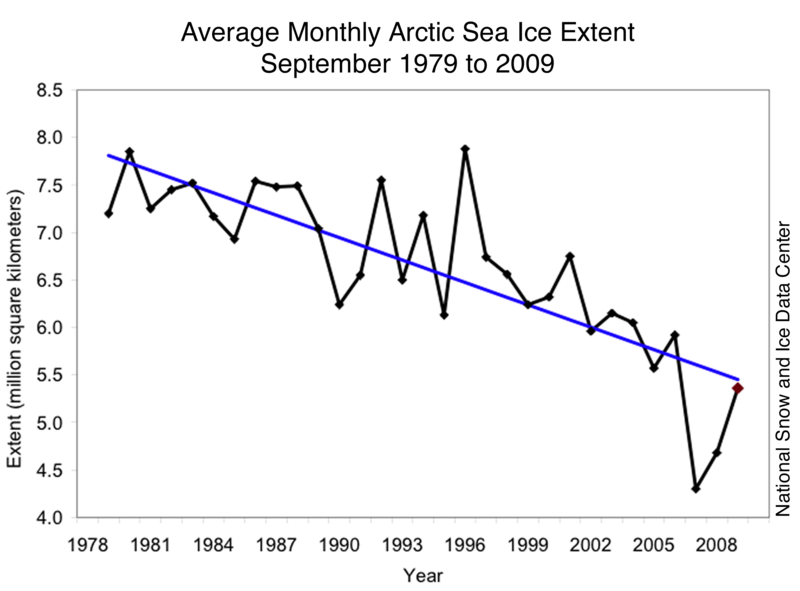 According to those records, Arctic summer ice has declined by about 30% since then. We wouldn’t want to be too hard on him for what might well have been an honest slip of the tongue. His prophecy (note the certainty of his statement) about an ice free Arctic summer, is far more malignant. The IPCC’s AR4 estimates it will take 50 to 100 years for that to happen. But there was a record melt after AR4 was written, so NSIDC has come up with a ball-park date of 2030 based on extrapolation from recent melting trends. Other estimates range over many decades and well into the next century. We assume Hari must be referring to Jay Zwally’s study, which is mentioned here. If so, he is missing a trick; if he wants a single scientist’s estimate to speak for science, he could have quoted David Barber of the University of Manitoba who predicted an ice free Arctic summer by last year. At issue is not really ‘what science says’ about the world’s temperature, nor even speculation about the date at which we can expect the Arctic to be free of ice in summer. The majority of climate scientists could easily take issue with Hari’s silly claim, but it wouldn’t be a very interesting read. What is at issue is the way in which Hari carries on not only making up stats such as this, but wielding them as some kind of talisman, which gives him moral authority. His wild speculation about the future of Arctic ice speaks more about the way in which ‘the science’ exists as a means by which Hari can express his shrill internal dialog. He makes stuff up to give himself a voice, and defends it by claiming to be the vessel through which science speaks. He, like the vast majority of scientists, is the sceptic, he announces. Pity that he’s not such a sceptic that he ever checks his own argument. As we’ve said previously, this inability to self-reflect is the symptom of the angry, shrill, non-scientist, moralising, and disoriented journalist-activists such as Monbiot, Lynas, and now Hari. What they write is science fiction. They incautiously assemble scientific factoids, removed from their scientific context, to construct terrifying narratives about the future. This elevates them to the status of planet-saving super-journos, and from this platform their bizarre stories become the device through which they interpret the world. But they are merely peering into their own arseholes, not, as they claim, through the prism of scientific objectivity. What they see is chaos and catastrophe, but what they do not recognise in what they see is that it is entirely their own confusion staring back at them. So let’s – for the sake of argument – make an extraordinary and unjustified concession to the deniers. Let’s imagine there was only a 50 per cent chance that virtually all the world’s climate scientists are wrong. Would that be a risk worth taking? Are you prepared to take a 50-50 gamble on the habitability of the planet? Is the prospect of getting our energy from the wind and the waves and the sun so terrible that’s not worth it on even these wildly optimistic odds? We’ll leave aside Hari’s claim that ‘virtually all the world’s climate scientists’ agree that climate change is set to render the planet uninhabitable, other than to say that he seems to be confusing ‘virtually all the world’s climate scientists’ with the singular James Lovelock. Imagine you are about to get on a plane with your family. A huge group of qualified airline mechanics approach you on the tarmac and explain they’ve studied the engine for many years and they’re sure it will crash if you get on board. They show you their previous predictions of plane crashes, which have overwhelmingly been proven right. Then a group of vets, journalists, and plumbers tell they have looked at the diagrams and it’s perfectly obvious to them the plane is safe and that airplane mechanics – all of them, everywhere – are scamming you. Would you get on the plane? That is our choice at Copenhagen. So Freeman Dyson makes lists. While I’m certain he’s a smart guy, I would not take a sick child to him, and I won’t take a sick planet to him either. In both cases, he simply does not have the relevant specialist knowledge. That also applies the large number of social scientists, computer programmers, engineers, etc., without any specialist knowledge on this problem. The bottom line is that the opinions of most of the skeptics on the list are simply not credible. Unfortunately for Dessler, we tested his claim that the IPCC were the specialist doctors in his analogy by counting the specialisms of the latest IPCC report’s contributors. It turns out that many of them were precisely the ‘social scientists, computer programmers, engineers, etc., without any specialist knowledge on this problem’ that he had complained about. (You can read about WGI here, WGII here and WGIII here). Our detractors argued that we had been disingenuous, and that only IPCC WGI counts, the other two groups – which comprised a much larger proportion of ‘non-expert’ opinions – being less concerned with the ‘Physical Science Basis’, and focusing instead on ‘Impacts, Adaptation and Vulnerability’, and the ‘Mitigation of Climate Change’. This misses the point that the arguments about what kind of problem climate change is and what to do about it emerge almost exclusively from WGII and WGIII, not from WGI, yet the putative scientific authority of the IPCC emerges exclusively from WGI. What Hari, like Dessler, forgets is the difference between the sensitivity of climate to CO2, and the sensitivity of society to climate. Or to put it more broadly, there is a difference between the natural world’s sensitivity to CO2, and human society’s sensitivity to changes in the natural world. Hari and his ilk like to stress the equivalence between the environment’s and society’s sensitivity. They seem to feel that once the scientific case has been made, the political and moral argument has been had and won. This environmental determinism, we have argued, reflects the hollowness of their own outlooks, hence the interminable screeching, hectoring and ranty tone of commentators like Hari, and our favourite, George ‘air travel is like child abuse‘ Monbiot. We can all tell stories. You’re about to get on a plane with your family. A group of shrill and sanctimonious journalists from the Guardian and Independent newspapers tell you that, if you take the journey, poor people all over the world will die wretched, horrible deaths. They show you statistics showing how many people have died already, and how many more will die in the future. ‘You will be culpable for their deaths’, they say. ‘Do you want their blood on your hands?’ they ask. Then another group of non-experts arrive. They say that there are many ways to understand the poverty that kills people, and that not taking the journey won’t make such lives any better. The journalists return, they say that the other group are funded by huge corporate interests, and cannot be trusted because they are either mad or bad. They tell you that they have science on their side, that climate change is real and is happening, and that they have witnessed its ravages for themselves. Who are you going to trust,’ they demand, ‘us, or the other group?’ Shouldn’t you take the cautious route, just in case? After all, they might be right. You step down from the plane. But as you walk across the tarmac, you notice that the journalists are now getting on the plane. Some of them are going to Copenhagen. One is heading across the Atlantic to lecture Canadians about their climate responsibilities. Another is off to the Arctic, to see some climate change.